Retractable and Pop up trade show displays can encompass many different forms. 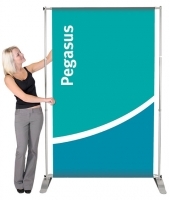 Some of the most popular pop up displays are retractable roll up banner stands. These pop up display stands are used as a hassle free way to set up your trade show display. They set up in seconds, hold/house digitally printed banners and look highly professional. Other display pop up options include X banner stands and L banner stands. A table top banner stand is also a great option for trade show displays, depending on how much space is allotted in your booth. Poster stands holding full color posters are also another great option along with other quick up and down options. All of our pop up trade show displays are individually selected based on their quality and overall visual appeal. We bring our customers the best pop up displays at affordable prices!